Mechanic's Assistant: How has the ride been lately? Have you noticed any fluid under the car? Mechanic's Assistant: Are you fixing your MKX yourself? What have you tried so far? That's about it - how does this service work? Hi Im David, there is a TSB that is related to this type of behavior. I have attached it so that you can read over it. that's the one. Step 8 says to install a new intake manifold bracket to the intake manifold and to the cylinder head. Do you suppose there was no bracket on the 2007's? And on the 2008's, do you suppose that "install a new" means "take off the old and install a new" - in other words, did the 2008's not have them either, and this is a retrofit to fix this issue? It means to install a bracket like it wasnt there. apparently depending on the buils date of the motor depends on if it was alreadt there or not. Looks like MKX and EDGE didn't have it, Some MKZ's had it depending on build date. So I imagine that my car's doing something like what's described here - can you hazard a guess as to what is happening here - that is, the underlying mechanism? I'm thinking that some sort of slight bump causes the intake manifold to move relative to the cylinder head, which causes a hiccup in the engine, which causes a new jolt, which causes another cycle of relative motion, etc. Presuming there isn't a place to mount the bracket on the 2007's, I could try other ways to stiffen up the mounting. Do you think this is electrical (ignition) or air flow related? I believe its airflow related based on the fact that they are also replacing the vacuum hose and check valve to the brake booster. I think a phone call to your local ford dealerships service dpartment would enlighten you on the main purpose. OK - this has been helpful - the dealer couldn't find the problem, but wasn't apparently aware of the 2008 MKX problems which might be related. I now notice that as you say, they put in a bracket and two bolts, and replace the vacuum hose assembly. I'm going to look under the hood and see if jiggling anything can cause the engine to stumble, but will try to get the dealer to deal with this! OK - I'm out of here - even though I knew about both service bulletins we discussed, talking it through with you helped me a good bit. I've not used the service before, and I'm not keen on a monthly subscription, but at least this interaction is worth the price of admission... Thanks and I guess adios? ok, and yes, we can close this out, and since you werent happy with the results, a rating isnt necessary. Hey David, thanks for following up on this question! I do have a couple more things to clarify. The strut that's supposed to be installed between the block and the intake manifold is apparently discontinued and my mechanic can't find it. But if this is the solution (and it really seems like it should be), I think I should be able to "prove" it by stabilizing things with some sort of temporary prop and if this changes things dramatically (frequency, duration, etc.) then I can keep searching for the part or even have a mechanic make one. So now I realize I'm not sure what it is that needs to be stabilized. I reasoned that the portion of air intake that's visible in this image could be vibrated and if that caused a hiccup in the system, a self sustaining resonance could be set up. 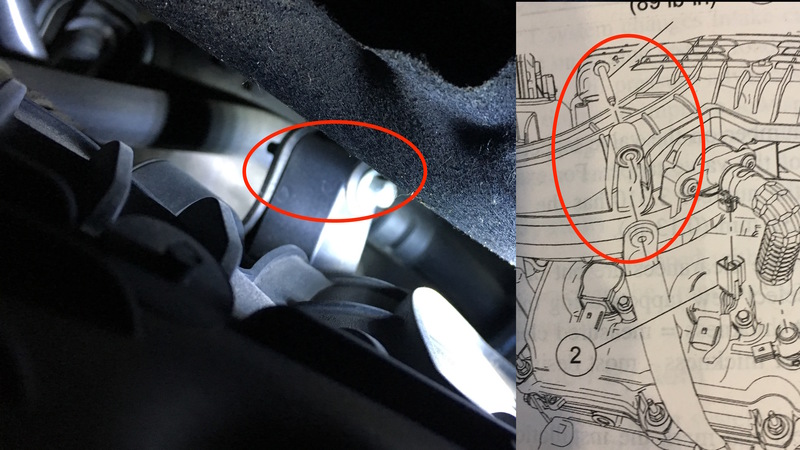 I looked around my garage and found a fishing rod holder that happened to have a circular end about the size (2") of the space between that portion of the air intake and the engine top cover. I used duct tape and a couple of bungees to make it stable and figured it would definitely change harmonics, but found it made no difference whatsoever. So I find I probably don't know where the intake manifold really is, and where this "intake support bracket" is supposed to go. Is this on the back side of the engine (facing the firewall)? Is there some logical place to try to access whatever is unstable (presumably the intake manifold)? A couple of pictures would really help, Note I do actually have the workshop manuals, but I'm still not getting a clear picture of where this stuff is..
the bracket doesnt go across the top. thats not doing anything. especially with bungy cords. the bracket goes from the front of the block up to the intake manifold. and it bolts on. OK, I finally found enough diagrams to understand this. This is on the part of the engine facing the firewall, and I really didn't understand what all was back there. The bad news is that I seem to have an upper intake manifold support bracket installed. That's probably why this only applied to 2008's - they may have decided to delete this unnecessary support and found they were wrong? Looks like it's back to the drawing board. Thanks for your help in any event! Here's a photo looking back at the firewall from on top of the engine that shows the bracket.